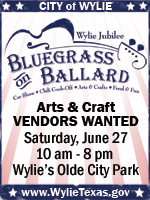 "Wylie will indeed be wide awake June 27 for Bluegrass on Ballard, a free festival featuring top bands, a car show, arts and crafts and great food. The event in historic downtown Wylie breathes new life into the city’s longtime moniker and continues the tradition of drawing citizens and members of neighboring communities into the heart of the city. Arts & Crafts in Olde City Park: 10 am – 8 pm"
"We are an Outdoors Open Air Trade Days with an 1800s theme! We are open the 2nd & 4th Weekends Every Month! We advertise in many places to draw in customers one being on 99.5 The Wolf's Live Stream Radio!! We offer FREE Entertainment on Saturdays! A Fun Draw for the Shoppers and Fun for the Vendors!" "Alvarado Trade Days is a new monthly event held on the lst Saturday of each month on the square in Alvarado, Texas, 20 miles south of fort worth on i-35. This will be a indoor outdoor event on the square in Alvarado. The last Saturday of every month will bring out the best crafters in Tarrant and Johnson counties. All proceeds from this event will go to the heritage museum. " "Thank you for your interest in becoming a Vendor with Market Shoppes @ Handley Heights Place, located in the Historic Handley District at 7101 E. Lancaster Avenue, Fort Worth 76112. The Market Shoppes @ Handley Heights Place is scheduled every Friday and Saturday through October 31st." "Grapevine Market is held every Thursday and Saturday April 9, 2015 through October 17, 2015. Located in Liberty Park across from City Hall, Grapevine Market features a variety of vendors offering home decor, collectibles and much more."